When you're running your 20 miler, you will learn how to dig deep and find those tools and/or tricks to keep your mind occupied and not let those (what I refer to as) "demons" get into your head and make you start to doubt yourself and your ability. Marathons are 10% physical and 90% mental. I remember the first time I heard this. I didn't believe it at first. It took me quite a few marathons to really learn how to tame those "demons" and to allow only positive thoughts into my head. Practice those tricks for mental toughness during your next long runs. When you're at mile 17-19 practice some positive mental exercises. 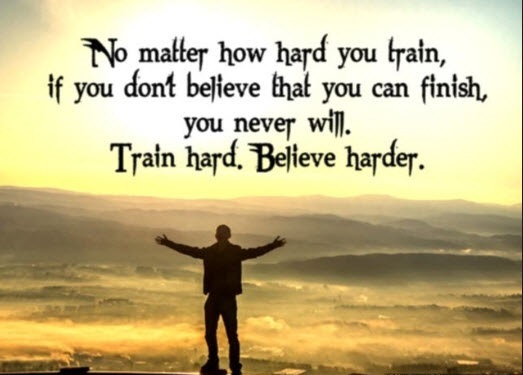 The mind and body are so well connected that to achieve a good outcome, you need to have the proper toughness mindset. The right internal state must be created first. Once you feel right inside, a quality performance can occur naturally and effortlessly. YOU NEED TO BELIEVE IN YOURSELF! Trust your training! Direct your focus to what is possible, to what can happen, toward success. If it's raining - so what! Embrace the free cooling stations, if it's windy - Yeah! Pretend the wind is pushing you! Don't complain about the weather! If you want to be a mentally tough runner, only attend to things you can control: Your thoughts, emotions, training form, and how you perceive each situation. When I get tired - I think to myself "keep your good running form - don't slouch, take a deep breath and dig deep - think to yourself "I am a machine - I CAN do this! If those demons kick in - yell at them and say "F%& YOU! There is NO WAY I will allow you to bring me down! Think positive - "this is MY day! I AM finishing this marathon and I AM finishing strong! Use the crowd support - when someone cheers for you smile and "High-Five" them. Distract your mind! You have a choice in what you believe about yourself. Positive energy makes peak performances possible. Take 10 or 15 minutes each day to mentally rehearse your goals. Then carry all those positive feelings of self-confidence, energy and strength into your mental practice of an upcoming event. See yourself doing it right. Finally, use your imagery all the way through the event itself. I sometimes close my eyes for a couple seconds to relax during the marathon. I call this my "auto-pilot" running. When my body has pretty much had it and I have a couple miles left. Just remember "When your mind says "NO" the body will still go" I'm not sure why or how this happens but I am such a believer in this.